For this post, I will revise the organizational messages put out by Godfrey’s in Richmond, Virginia. On their website, Godfrey’s presents their information in ways that sufficiently allow the audience to make informed decisions. Godfrey’s staff is the primary speaker on their website; however, patrons of the club also have a voice in the #GodfreysVA Instagram feed located on the homepage. Through featuring patrons’ experiences on their website, Godfrey’s allows them to engage in their own discourse about their experience. The website represents the interests of those internal to the organization (employees) as well as those external (prospective, past, and current visitors). These interests include the success of the club, the welcoming environment it offers, and the excitement of the drag shows performed within. The photos on the top banner provide a preview of what the performances entail and offer a glimpse at the culture that exists within the club. The photos under the “Drag Brunch” and “Drag Dinner” sections serve a similar purpose. All of these strive to entice prospective visitors into coming to performances or events. Unfortunately, some crucial components of Godfrey’s history and culture are excluded from this rhetoric. 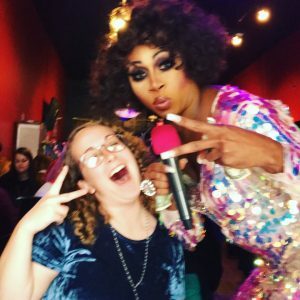 The “Our Story” section of the site states, “Godfrey’s has had many successes and challenges over the years, but through it all we have strived to be a place of diversity, inclusion, and just plain fun for the RVA community.” This is vague and seems like a missed opportunity to build organizational credibility. For example, including details about some of the struggles the club has faced throughout their time in Richmond may foster a sense of respect for their perseverance in the face of adversity. Additionally, the “Our Story” page seems to group a lot of information into one section, making it somewhat overwhelming for readers. Godfrey’s might consider revising this into several different pages such as “History,” “Policies,” and “Staff.” Additionally, written testimonials from Godfrey’s visitors would likely build the organization’s ethos because, unlike the Instagram photos already featured, these are almost always written as reflections after leaving the club rather than in the moment (like the Instagram post would be). The Instagram photos are useful because they show the excitement visitors feel and their desire to promote their experiences in the moment; however, testimonials would assert that going to Godfrey’s is a lingering positive experience. Lastly, none of the “Night Life” sections display any photos from these events. This absence of visuals suggests that the events are not worth photographing and, by extension, dull (especially in comparison with Drag Brunch and Drag Dinner). Adding visuals to these sections would capture more interest in these events.